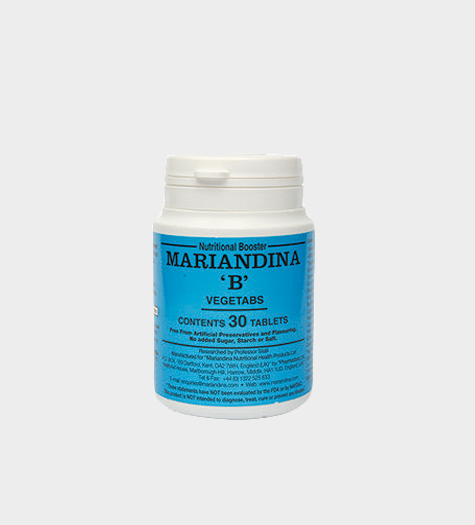 Mariandina B increases blood circulation in the brain, sexual organs and heart to rejuvenate them to function more efficiently and overcome stress. Tag: Mariandina B Contains 30 Tablets Per Bottle. Mariandina B is an advanced natural composition consisting of 23 natural herbs and vitamins such as Siberian Ginseng Powder, Alfalfa leaf, Golden seal Root, Vitamin E, Gotu Kola, Betacarotene, Kola nut, Bee pollen, Liquorice root, Hawthorn Berry, Capsicum, Yellow Dock leaf, Echinacea, Purpurea, Ginkgo Biloba leaf, Garlic, Co-enzyme Q-10, Vitamin C, Di-basic Calcium phosphate and Guarana that increase blood circulation in the brain, sexual organs and heart to rejuvenate them to function more efficiently and overcome stress.